In case y’all haven’t noticed. I love junk. Any kind of rusty old junk. I’m on it. And chippy, peeling doors. And vintage anything. 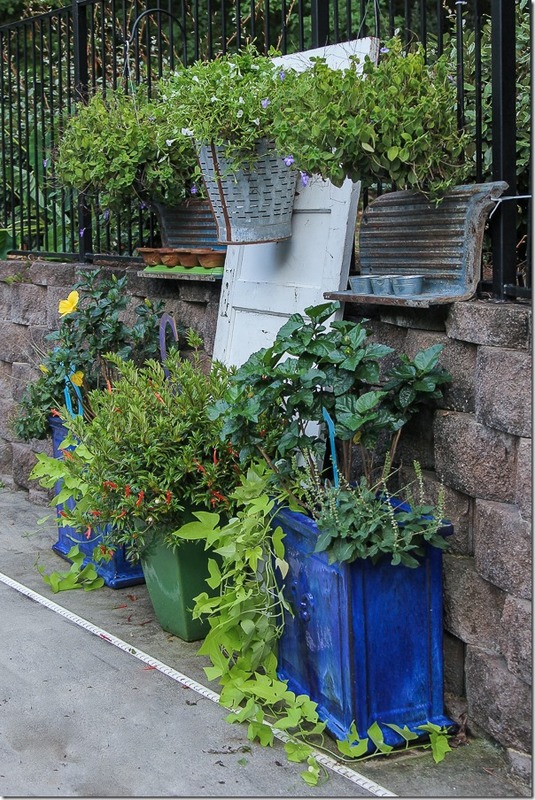 So, when I combine all of those elements together with some beautiful container gardens it kinda makes my head want to explode with joy. 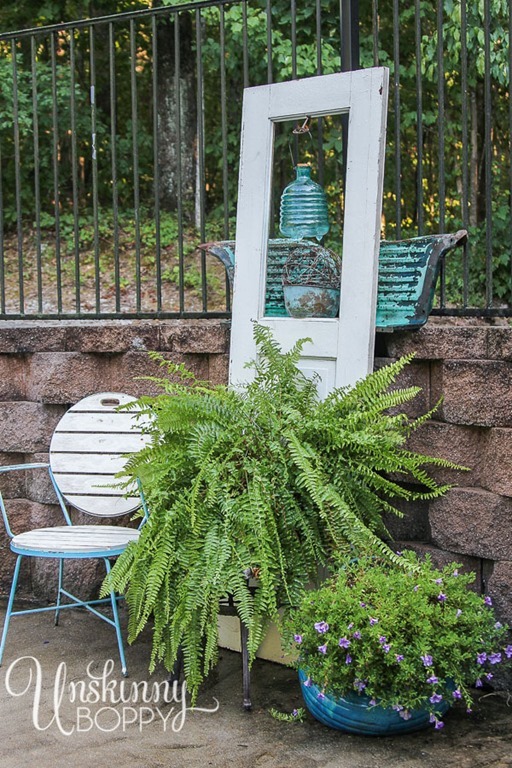 I might as well get it over with and change my name to Tow-Mater, because I am in LOVE with these rusty aqua sideboards from an old Ford truck (or Chevy? What the heck are these things… I have no idea.) I spotted them at one of my favorite vendor booths at Antiques in the Garden last April, and knew they needed to be mine. Finally after a few months of hanging out in the garage, the idea came to me. 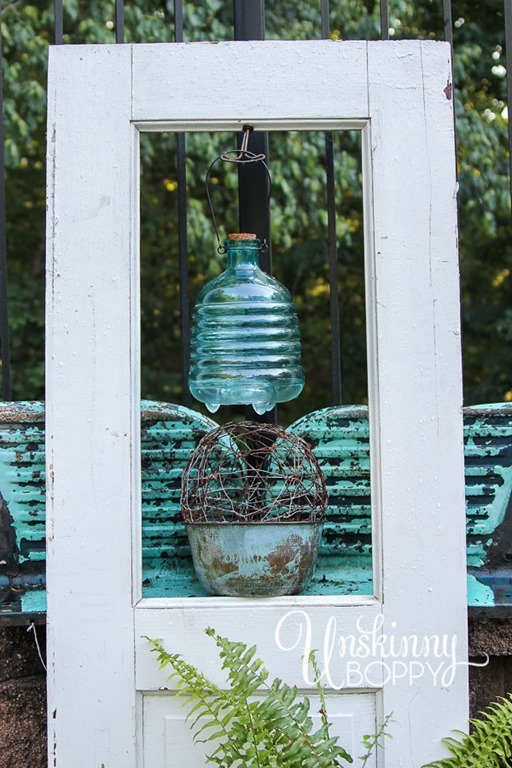 I envisioned rusty old angelic butterfly wings peeking out from behind chippy wooden doors. I mean really. That turquoise color? Beside my blue pool? Are you kidding me right now? 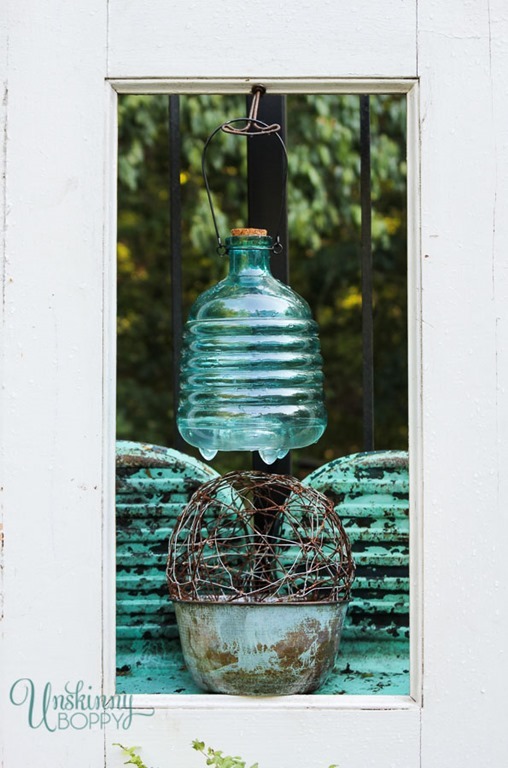 Combine them with my new aqua wasp trap and a pretty blue bowl, along with a rusty wire globe and YES. I’m in love with this window to my backyard. Since that pinkish /beigish/ mildewish split face rock wall that surrounds my pool gets really.friggin.monotonous after about the 24th linear foot, I decided to break the wall up a bit with some height and light and greenery. I hauled these two white doors out of the garage and played around with the arrangement until it felt right. I totally killed two birds with one stone with this project— 1. Clean out the garage, 2. Decorate the pool patio. Here is the other arrangement. These blue running boards (Step sides? What the heck do you call these rusty truck thingies??? Somebody help me out here.) 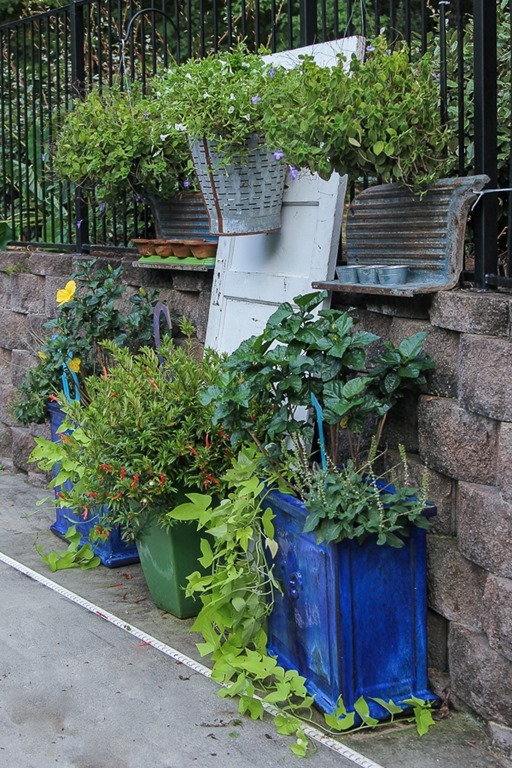 Anyway, they were a bit bigger than the turquoise ones, so I used them over my blue planters. I love it when it’s lush and tropical and green like this outside. It was about 100 degrees while I was shooting these pictures. I was sweating like a moose. I felt like I was in some kind of crazy vintage rainforest. And I loved every minute of it. How’s this vintage olive bucket for some gorgeous door décor? 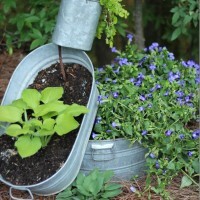 Gah… I seriously want to make out with this bucket. I just love it. Check back in later this week for a listing of where I bought all of this stuff, along with the names of all the plants in case you wanna try to replicate your own crazy vintage rainforest in your backyard. In the meantime, I’ve gotta make a run to the garden center and try to find some succulents to plant in those little wooden bowls all in a row up there. See those? You’re not gonna believe what that green thing is that they are sitting on. Wish me luck in finding some pretty ones. Stay cool everybody! 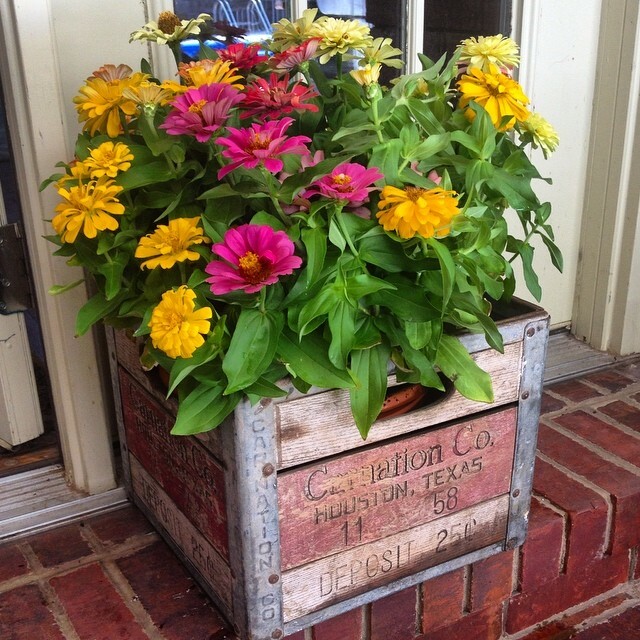 If you like a simpler approach to junky gardening, just plop a pot of pretty zinnias in a milk crate and call it a day! 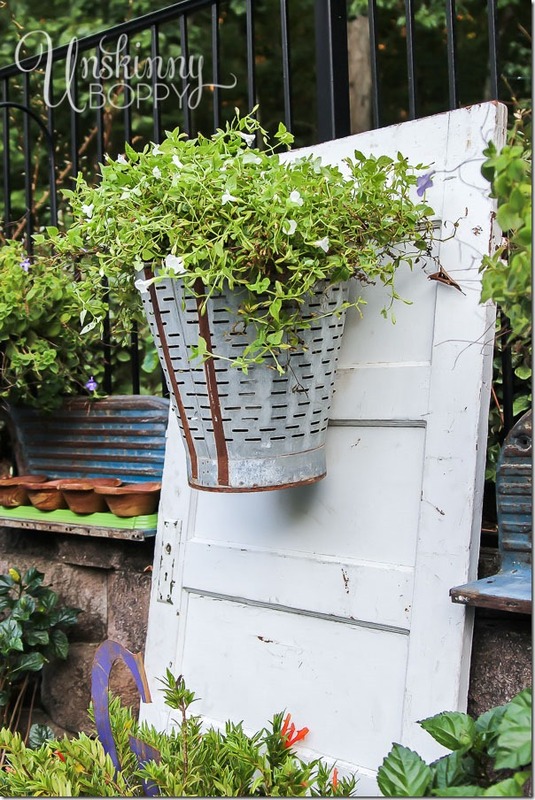 Here are a few others you might like where I’ve repurposed some rusty, chippy old junk! Go see! 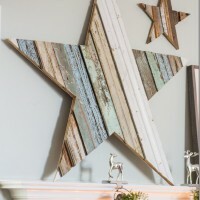 How to DIY a Giant Wooden Star from reclaimed wood. 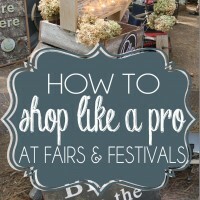 For all my DIY projects and ideas, click here. « State themed Projects are all over the map! Beth, this looks totally fantastic. What a way to take the dead out of the dead of summer! I LOVE it! Oh my gosh you are a genius with that rusty junk! It looks so good how you set it up and i love all the blue! I want to come over for a swim!! That looks great but the way my mind works now I need to know if moose actually sweat. I will look it up. Sweating like a moose. BAHAHAHA!!! You make me laugh, snort, and wish I was by the pool! Lovely, as usual. It all looks great! You did a wonderful job with it all. I love the way you write. It’s like sitting down and talking to an old friend. Your witty writing is so refreshing. 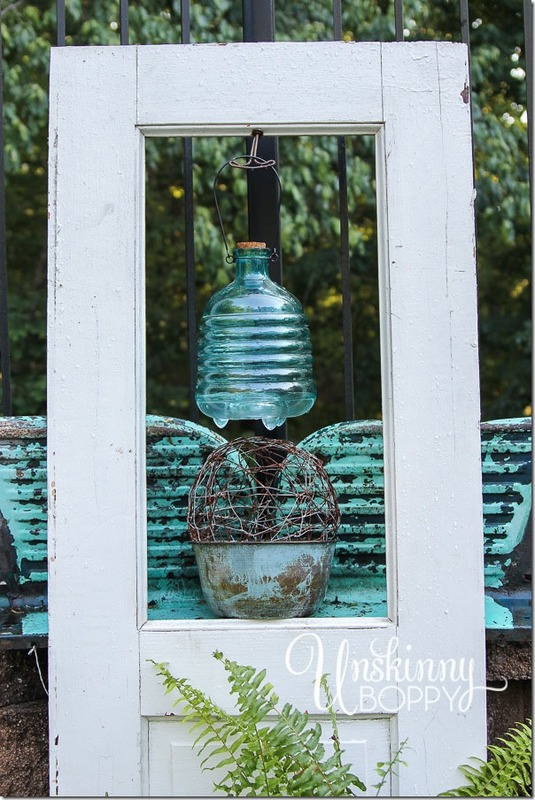 What you did with those old junk pieces is great. It became beautiful with all the plants. What a lovely pool area. 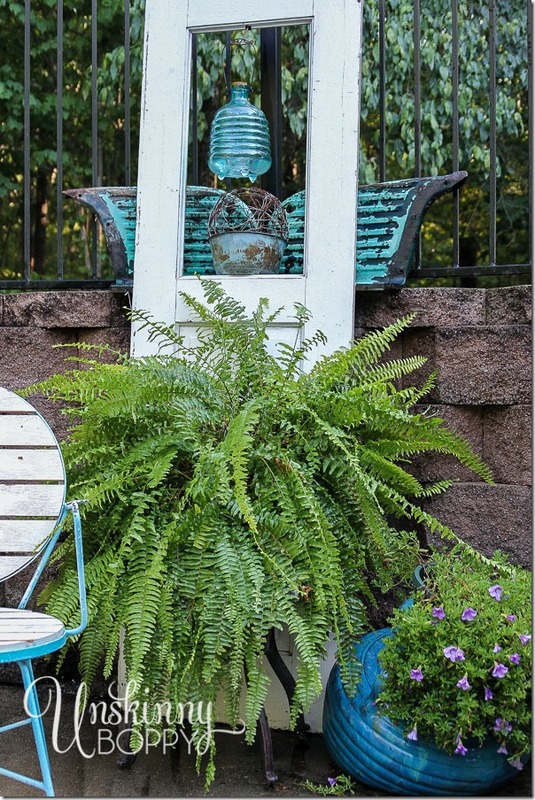 You have a wonderful eye to create such beautiful vignettes. I love your use of hard and soft. Beth, love this post!!!! 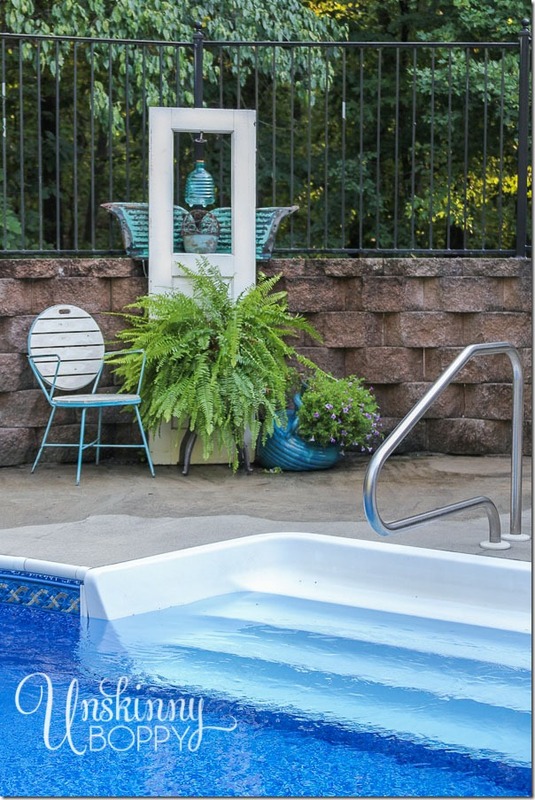 Beautiful way to decorate around your pool!! 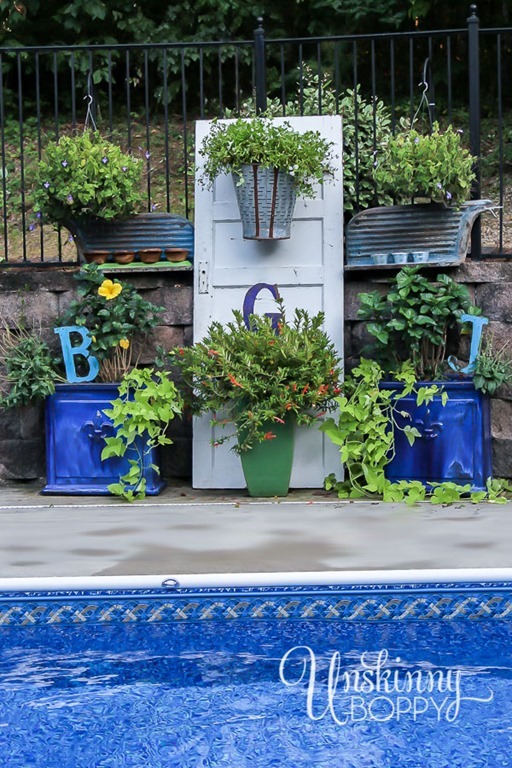 I especially LOVE the venue with the plain door, blue pots, and the initials! LOVE IT! Beautiful! the first vignette really looks like an angel…just perfect! What amazing junk! I love what you did with it. 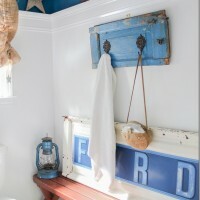 The sideboards are perfect in that setting and your reuse of the doors is perfection. I’m sharing this on my Once Upon A Firefly FB page! Thanks. Love using old stuff for other than what they were meant for. 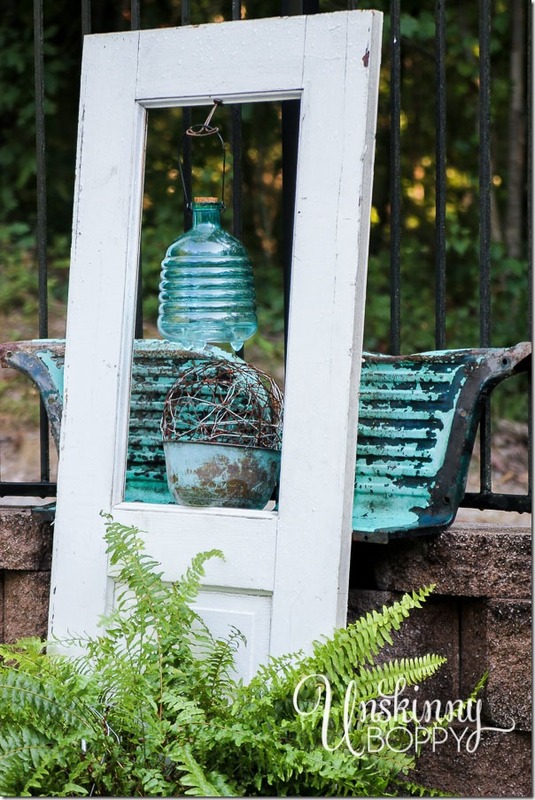 I adore your old doors, pots and running boards. So, what is the green thing that the wooden bowls are sitting on? You said we’d all be surprised, so surprise me!